The US military generally requires the 5.56mm ammunition it purchases for the M4 service rifle to be delivered in "combat pack." 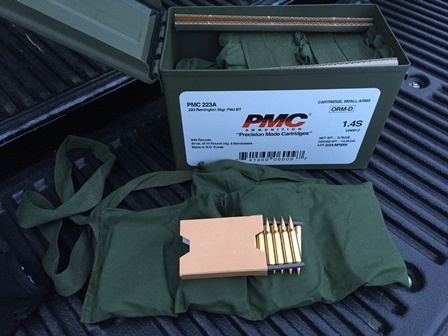 Combat packed ammunition is packaged in cardboard sleeves to protect the primers, and inside cloth bandoliers that allow many rounds of ammo to be distributed quickly and slung over the shoulder. 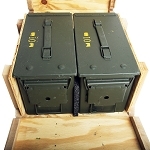 The bandoliers are loaded into metal M2A1 ammo cans which are housed, two each, in wire-bound, wood ammo crates for transport and storage. Within the bandoliers, each 10 rounds of 5.56mm ammunition is packed on a metal strip that holds the cartridges together for easier and faster insertion into the rifle magazine. These metal strips are known as "stripper clips." 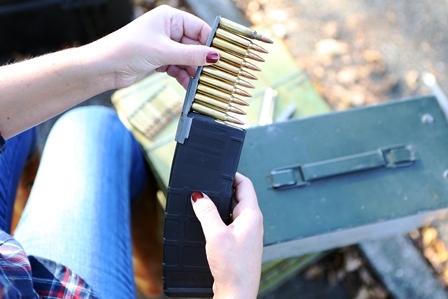 The rounds on the stripper clips are loaded into the rifle magazine with a metal magazine guide that is provided in each bandolier and allows all 10 rounds to be rapidly loaded with a single motion. Few hobby shooters have the benefit of owning their own shooting range or being able to shoot on private property free of charge. That leaves most hobbyists to rely on commercial shooting ranges that may, depending on the particular range, have hefty lane rental fees. It is common to see people spending the majority of their lane rental jamming mags, instead of shooting. 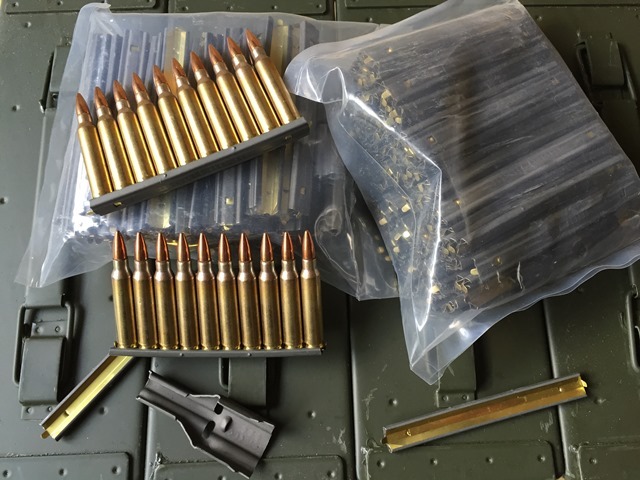 The reloading time eliminated by using stripper clips can be directly equated to savings on lane rental fees, or be applied toward more time shooting, rather than paying the range for the pleasure of loading magazines in their facility. Many people respond, "load your mags at home before you go." This is a good practice if your range will allow it. Many ranges, especially indoor ranges, require their staff to inspect all customer ammo to ensure there are no steel core rounds that will damage the facility. At these ranges, loaded mags must be downloaded for the staff to inspect the ammo and check it with a magnet. In these situations, stripper clips save a lot of time after the check-in process when the clock starts ticking and your ammo can finally be loaded. Stripper clips provide value beyond saving time during personal range sessions. They are also beneficial when attending group shooting events like carbine courses and shooting matches where prep time between evolutions can be minimal. 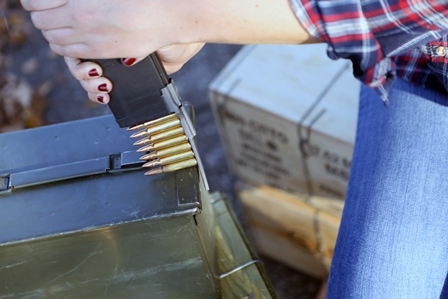 If you have your ammo on stripper clips, you are able to load much faster than the other shooters who are loading rounds by hand, allowing a little extra time to relax between drills or stages, get organized for the next course of fire or adjust gear. There are also organizational benefits to having ammo stored on stripper clips. Stripper clips are a great solution for those who find comfort in having a stockpile of neatly organized, combat ready ammunition ready for rapid loading in the event of a zombie apocalypse. 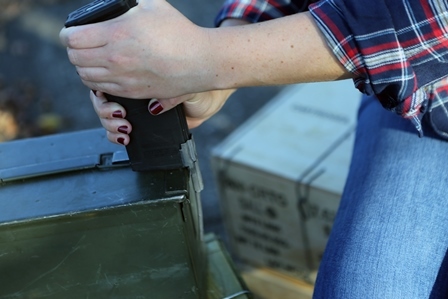 While the prospect of getting involved in a prolonged SHTF standoff is practically nonexistent, consider storing your ammo in a condition that actually promotes putting it into action in an emergency. 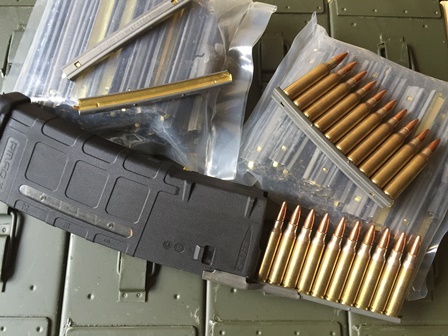 For the most part, stripper clips are only included with military-spec ammunition procured by the government for the M4/M16 service rifle, and to the commercial market by a few manufacturers at a premium price point. 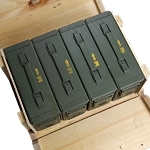 If you are not a defense or law enforcement professional, and prefer to avoid spending top dollar for military spec ammo for recreational use, once-unloaded packs of 100 stripper clips can be purchased for DIY application in the cleanammocans.com store. Slide the magazine guide over the rear of the magazine and into the groove on each side. It should fit fairly tight. The magazine guide is also known as a "spoon" or a "charger." Insert the loaded stripper clip into the magazine guide so the rounds are resting on the magazine follower. Firmly grip the magazine and magazine guide with your hand, invert the entire assembly so the ammunition is on the bottom, and the bottom of the magazine is now facing up (the loaded stripper clip will fall out of the guide if you don't hold it together when you flip it over). The inner edge of the stripper clip should rest along the edge of the hard surface you have chosen. 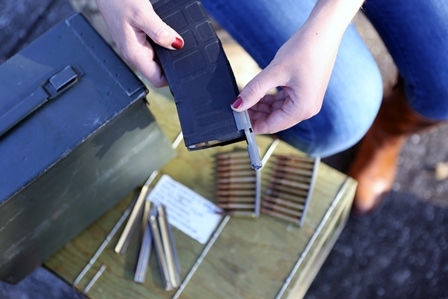 It is crucial to make sure the stripper clip and rounds are grounded flat against the edge of the hard surface so equal pressure is distributed across the rounds of ammunition as they are inserted into the magazine. Note: Make sure you have chosen a hard surface that will not be affected or degraded by a few scrapes during the loading process. Push the bottom of the magazine (now on top because it is inverted) with one hand and a bit of force down toward the table while firmly grasping the magazine and guide with the other hand, with gravity assisting, to rapidly load the magazine. The end tab on the stripper clip will automatically open from the force and allow the ammo to slide into the magazine. Retain the empty stripper clip to be reused. Most people that have trouble loading stripper clips are not using a hard surface against which to ram the rounds into the magazine. It is more difficult to hold the magazine in one hand and attempt to push the rounds in with the other hand. After a couple tries, you will find the process is simple and saves a lot of time compared to loading all 30 rounds by hand! To increase the service life of your stripper clips, avoid depressing the end tabs of the stripper clips all the way closed when loading the ammo on the stripper clips. Increase the life of your stripper clips by not depressing the tabs all the way closed or opening them all the way. This saves the tabs and allows the stripper clip to be used many more times. The tabs are the weak point in the design and fatigue as they are manipulated. For maximum longevity, you can even leave one of the tabs open without the ammo coming off the clip if you carefully handle your ammo.